French sculptor. Son of a sculptor of the same name (1729-1816) and a pupil of Franois-Joseph Bosio, he entered the Ecole des Beaux-Arts in 1818 and won the Prix de Rome in 1823. 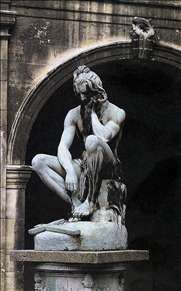 Among his works executed at the Acadmie de France in Rome is Orestes Mad (marble, c. 1825; Avignon, Muse Calvet), a colossal head modelled after the Antique that is at the same time a self-portrait, and Mercury Inventing the Lyre (marble; destroyed), an elegant statue much praised at the 1831 Salon. 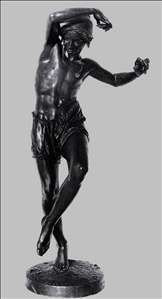 Journeys from Rome to Naples resulted in Neapolitan Fisherboy Dancing the Tarantella (bronze, exhibited Salon 1833; Paris, Louvre), which was executed on his return to Paris and was one of the earliest Neapolitan genre subjects in French 19th-century art. In this work Duret reconciled classical form with modern subject-matter and the freedom of modelling allowed by working in bronze. 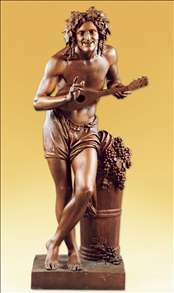 Its popularity led to reduced-scale bronze editions by the founder P.-M. Delafontaine, who also reproduced in this fashion Duret s Grape-picker Extemporizing (bronze, 1839; Paris, Louvre). See more details about "Chactas Meditating on Atala's Tomb"
See more details about "Grape-picker Extemporizing"
See more details about "Neapolitan Fisherman Dancing the Tarantella"